1954 marked the third year of direct competition between Bowman and Topps, as both companies fought to make and sell the definitive "gum card" to kids. Each side tried out new design ideas, signed popular stars to exclusive contracts, and made year-to-year strides in overall quality. They stood less than two years from Bowman's failure and sale to Topps, but I doubt anyone would've predicted it when this set hit the street. 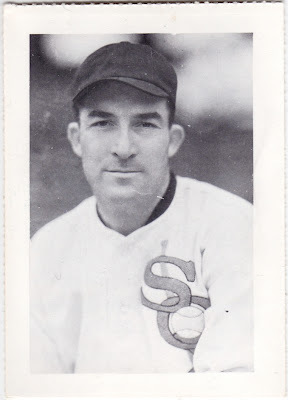 Today's card relates a similar baseball struggle between St. Louis's two franchises, the AL Browns and NL Cardinals. After the city's only crosstown World Series in 1944, pitched competition for fan dollars ultimately escalated into both sides trying to drive the other out of town. Business strategy played a large role, as the Cardinals went for wins and the Browns for "entertainment," so their outcome said as much about sports as an industry as baseball as a pastime. When the Cardinals "won" this business battle, the Browns (a.k.a., "the Brownies") moved to Baltimore after the 1953 season and became the Orioles. Bowman card editors must've written the back text prior to 1954 and then retouched Bill's jersey from BROWNS to ORIOLES just before printing. (Squint and you can still see BROWNS in there.) Find a shot of their "real" opening day jersey at The Baltimore Sun. The legendary Bill Veeck owned those Browns prior to their move east and made some enemies in his failed struggle to drive the Cardinals out of town. They must've written a book or two about that era, but check out Wikipedia's entry in the meantime. Fascinating stuff! When you hit #17, this order restarts with Tom Gorman, a Yankee. Player trades led to a handful of exceptions, but they're rare birds overall. Almost every card reliably fits into its place in this 16-team rotation. 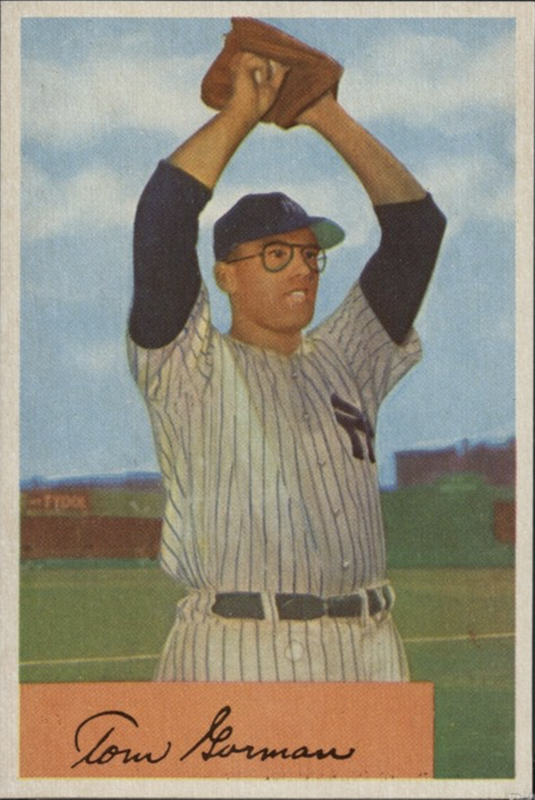 This infamous #66 became Bowman's "temporary Ted Williams." It's believed Topps threatened legal action due to an exclusive card deal with the Splinter and forced Bowman to replace his spot. 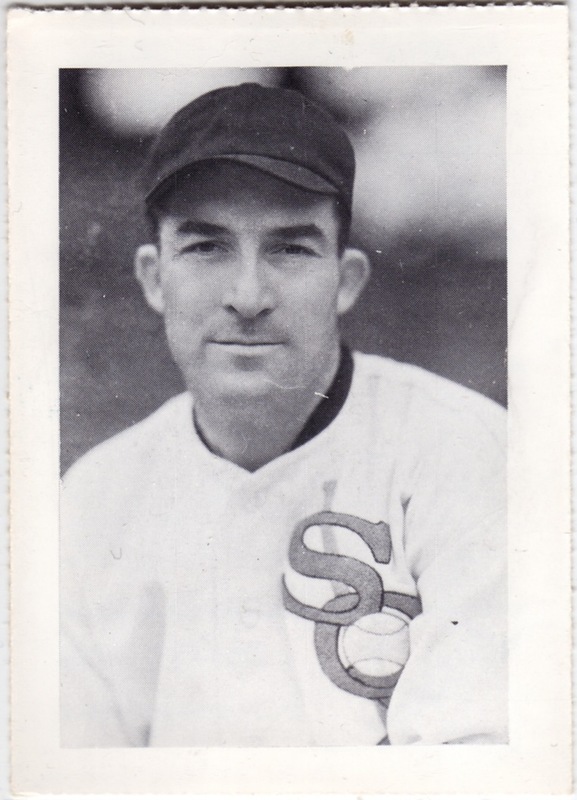 Both companies signed a number of players to the exclusive right for cards, with Bowman often getting the better end of things. 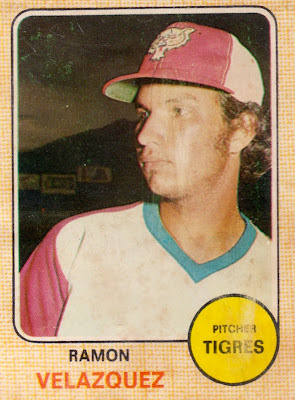 This time, Topps turned the tables on them. 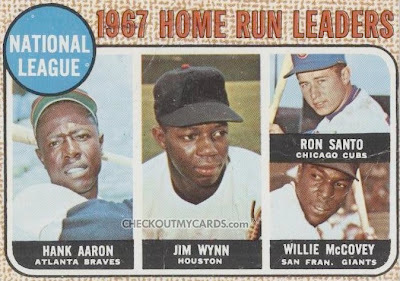 I assume Bowman's adherence to their checklist order explains our "switch-hit" for Piersall at #66. 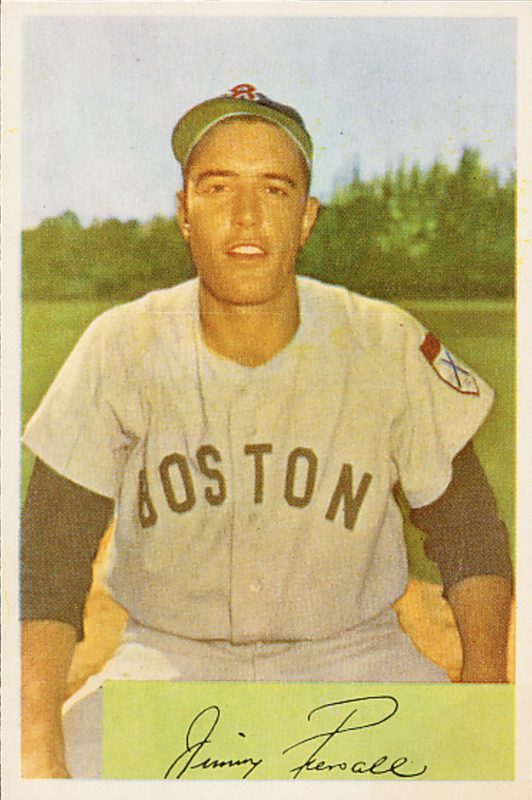 Ted Williams first took up a "Red Sox" space (#66), so would need a Boston replacement. 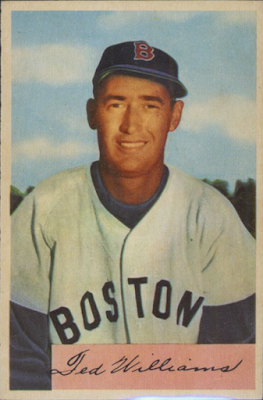 If we assume Bowman created most of their 1954 layout in advance, Piersall sat much later at #210, the final "Red Sox" space for a 224-card set. Since Jimmy stood furthest from #66 when he took over for Ted, perhaps Bowman thought they'd pull a double swap and find an alternative player for Piersall himself by the time they printed his sheet. If they did plan such a move, it never came to fruition. 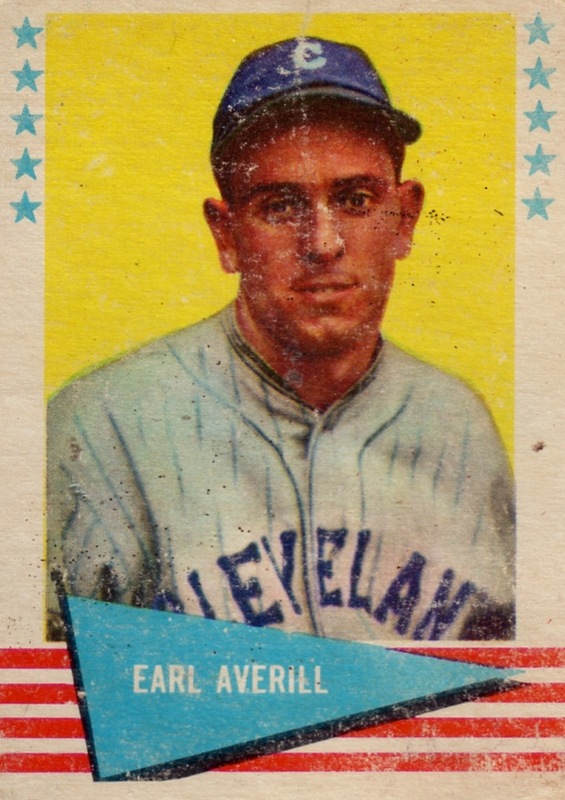 Card text mistakes led to numerous mid-set revisions, so perhaps Bowman scuttled any full-card swaps in favor of fixing their bevy of smaller problems and stuck with Piersall at #210, giving him two cards that year. 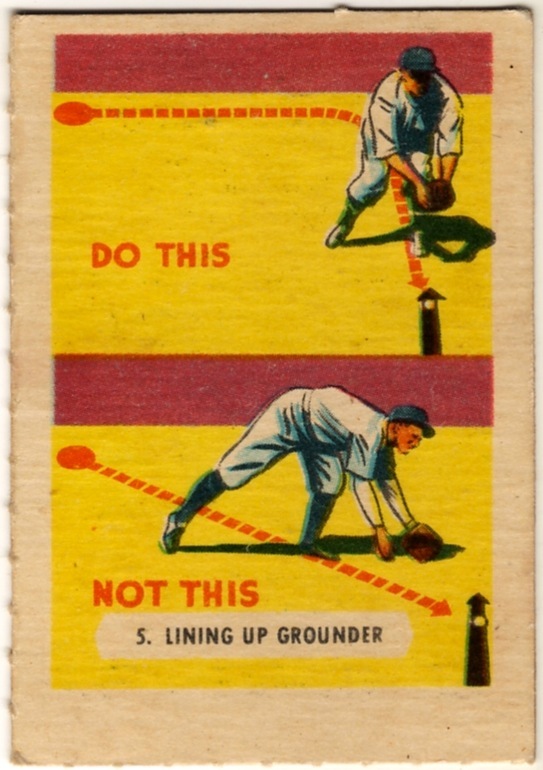 UPDATE: Found front and back scans of 1954 Bowman's wax packs! I'm a little surprised to see a label as simple as "Bowman's Baseball," but perhaps they put so much money into the card art, there wasn't enough time or budget left for the wrappers. 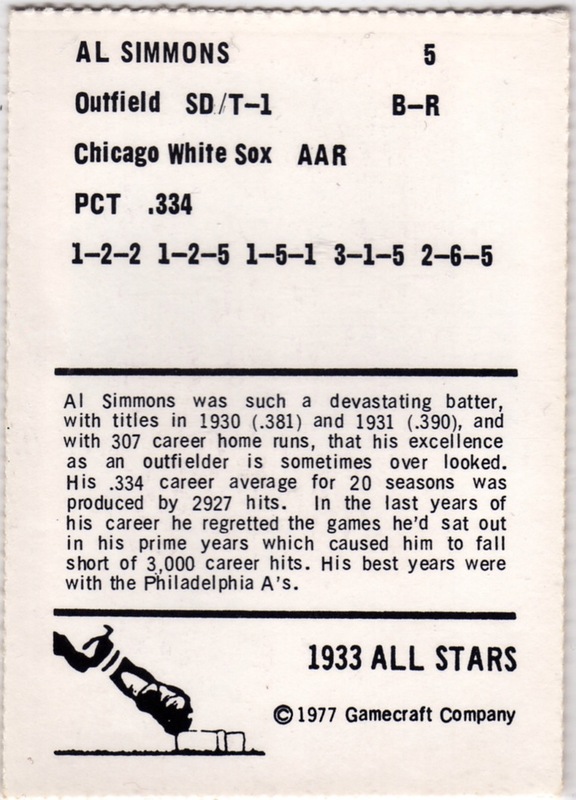 Value: Low-grade singles cost a few dollars or even $1 each in lots. 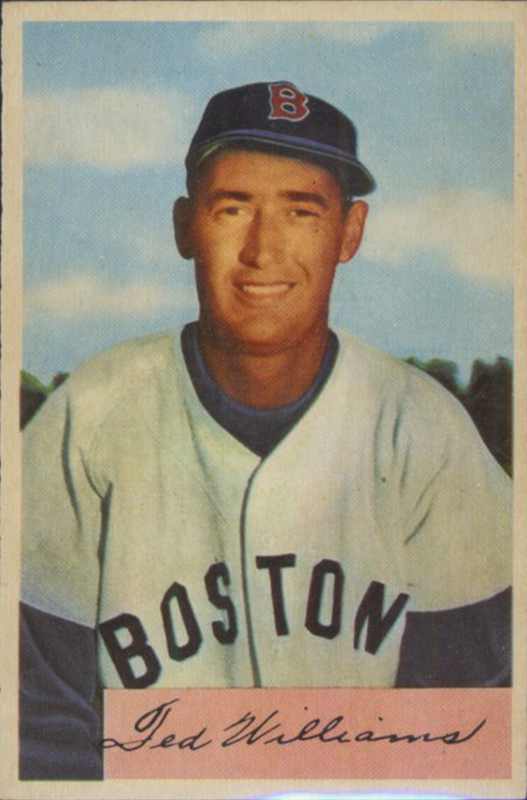 Fakes / reprints: Ted Williams stature makes his #66 card a common target for faking or reprinting. Some sets look so innocuous, you assume there's little to say about them. I started down that road with this simple, 3-color card featuring a Goofus and Gallant-style infield tip on the front, but should've known to expect more. Much more. 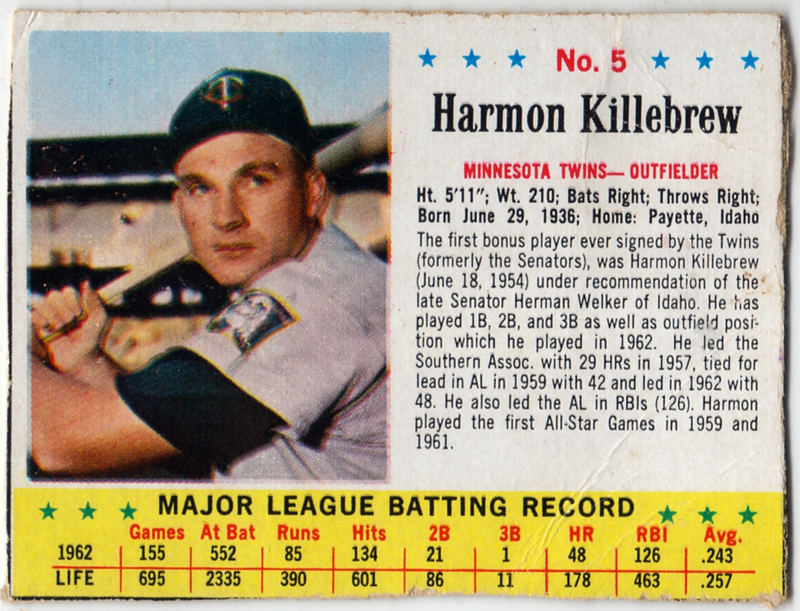 Actual size is 2.5" x 1.75"
Kellogg's set scope is what makes this card just a tip of the iceberg. They first cross-marketed cereal with baseball and other sports in the 1930s, soon after Wheaties achieved success by adding player endorsements. 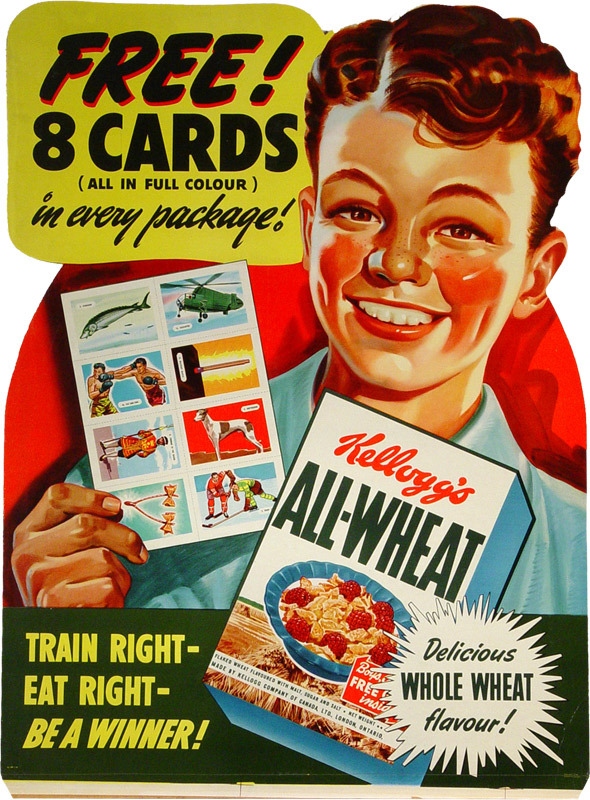 (Read more about that at "Wheaties and Sport" at PopHistoryDig.com.) 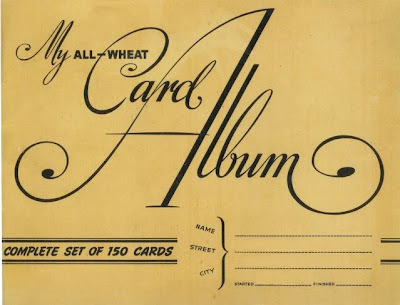 Two brands, Pep and All-Wheat, used sports issues as in-box promos, and although the latter existed for less than a decade, it no doubt pleased kids by creating three of these 150-card sets to collect and trade. It's hard to place in perspective now that baseball didn't establish itself as the predominant collectable card until Bowman and Topps kicked off larger-scale production and competition a few years later. Instead of featuring specific star players, sports tips, animals, military uniforms, combat vehicles, and fish all make an appearance. 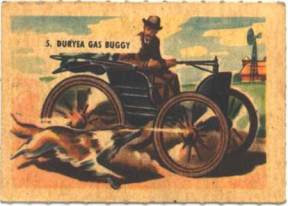 This Duryea Gas Buggy (another #5) comes from a Historical Autos subset. 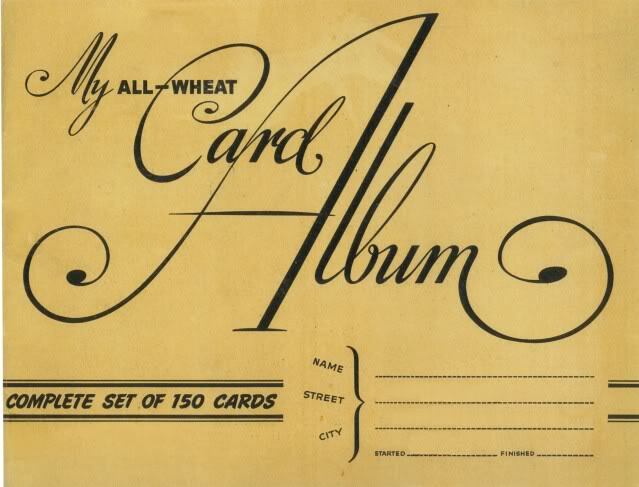 See the MrBreakfast.com profile of All-Wheat for a complete set scan. Kinda sad that of the 15 cards in this Strange Animal subset, only three feature dinos, and the brontosaurus doesn't even exist. As shown by this store display, cards came as box inserts on 2x4 perforated sheets, with subsets mixed together. 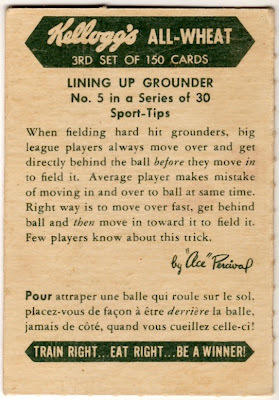 (I.e., no "all baseball" sheet.) Being able to just fold and separate cards kept them in much better shape than other food makers who put scissors in the hands of 4 year-olds. *cough* HOSTESS *cough* POST *cough*. It's not enough to collect cards without an album, right? Not sure how many kids managed to finish theirs, but this is a pretty cool all-around set. Who knew how much would be revealed from that first small card? 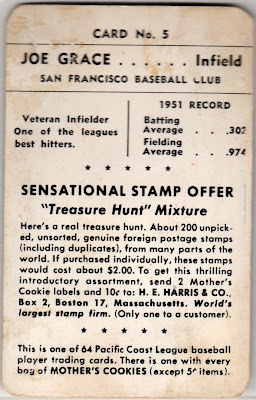 Value: Low-grade singles cost a few dollars. 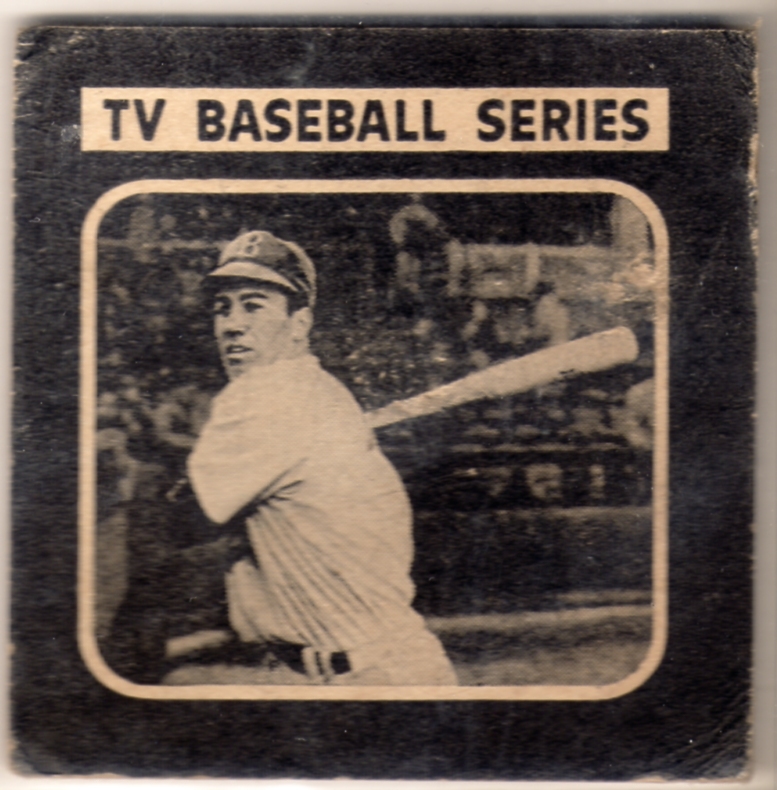 Dealers rarely know which year to assign to the set, so remember 1st set = 1945, 2nd set = 1946, and 3rd set = 1947. 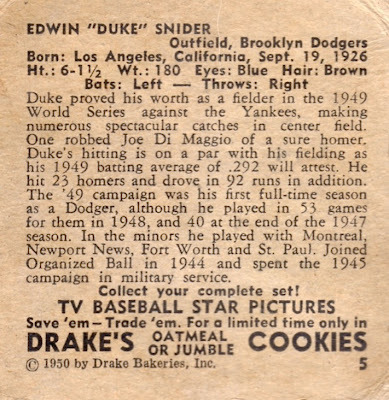 Yesterday's profile of Duke Snider (1950 Drake's #5) wasn't the only 1950s issue to cross-promote baseball and snack food. 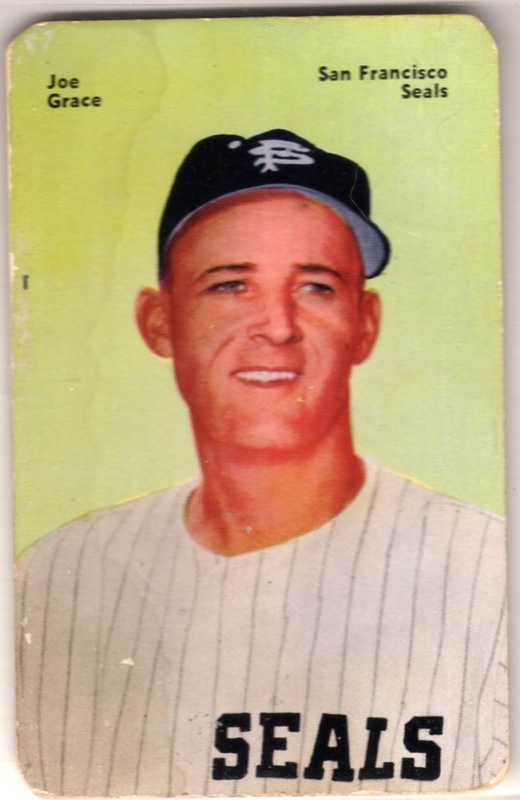 Oakland-based Mother's Cookies published two of their own in 1952 and 1953, but starring Pacific Coast League players. Both 64-player sets feature solid-background, hand-tinted photos, and capture the heyday of local pro ball prior to MLB's westward expansion. 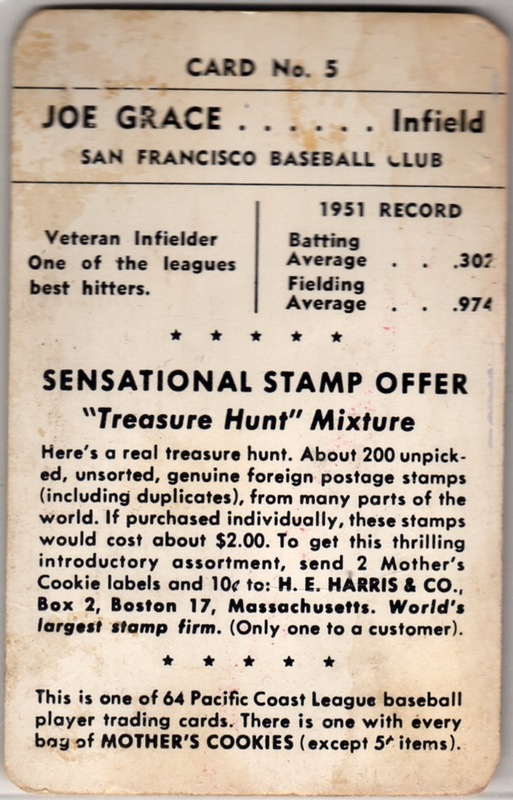 As a kid, I was psyched to sift through stacks of old stamps--the 1952 version of me would've sent away for that H. E. Harris "Treasure Hunt" Mixture without hesitation. 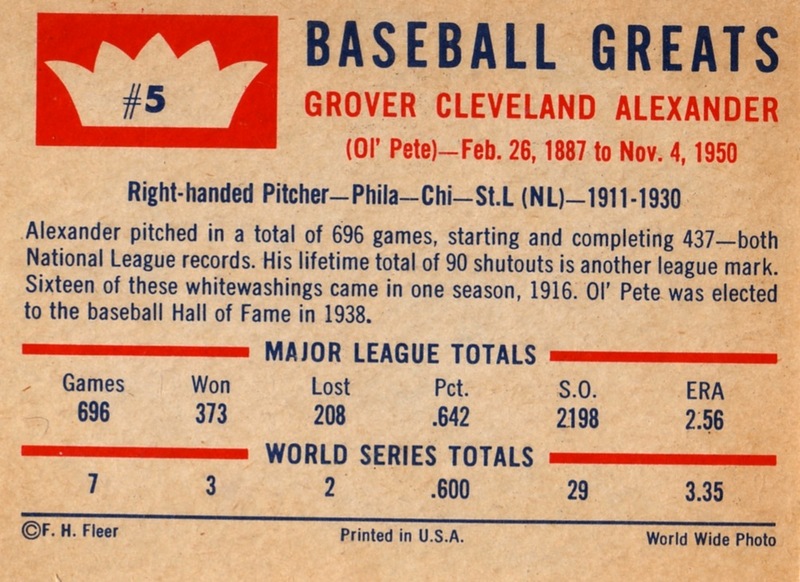 Grover Cleveland Alexander went by an assortment of nicknames both then and now, including Alec (from his surname), Ol' Pete, and Dode. Wikipedia's murky on the origins of "Ol' Pete," but confirmed his full name came from 19th century US president Grover Cleveland. 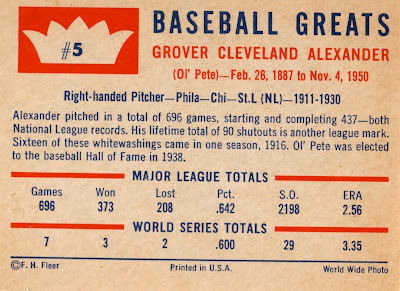 Whatever you call him, Alexander ranks as one of the finest pitchers in MLB history. Value: Bought this #5 at a show for $3. The set features plenty of stars, but few collectors find them appealing enough to drive prices up. 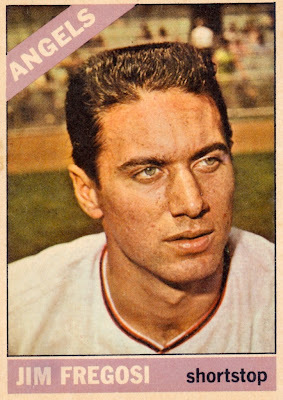 Back in the 1950s, Fleer gum badly wanted to break into Topps' baseball card market, but were stymied by their exclusive contracts with almost every active MLB player. Fleer finally got a foot in the door by signing Ted Williams and issuing an 80-card set dedicated to his career (#5 set profile), but other big leaguers remained elusive. 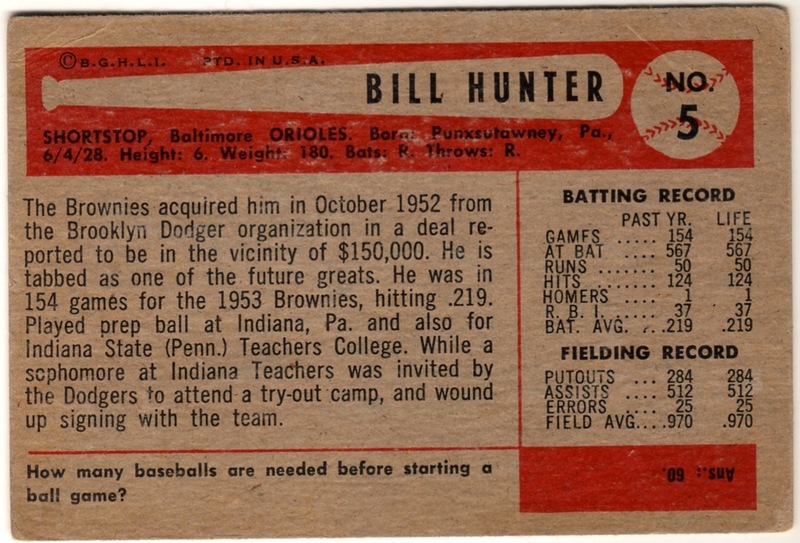 While Fleer tried to build a roster of active players behind-the-scenes--an effort that would ultimately lead to 1963's set--they published a pair of Baseball Greats sets in 1960 and 1961. 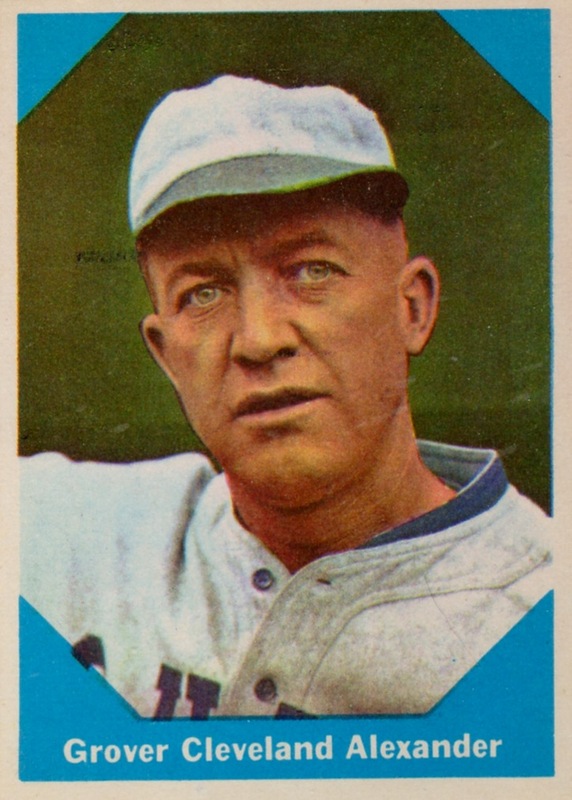 The latter, this 154-card retrospective, features an America-themed design and colorized black-and-white photos of HOFers and other retired greats. Like Joe DiMaggio and many other West Coast natives, Earl Averill started his pro career in the PCL, well before expansion brought baseball to California. 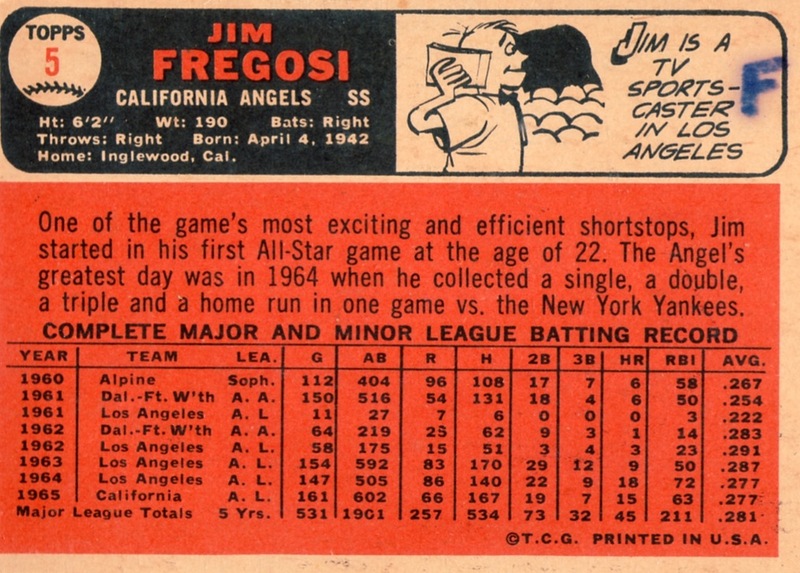 As mentioned in my 1949 Yakyu Shonen #5 profile, those teams played nearly 200 games per season, and even hosted exhibitions against MLB teams or toured for additional money. That didn't leave much time for off days and vacations! 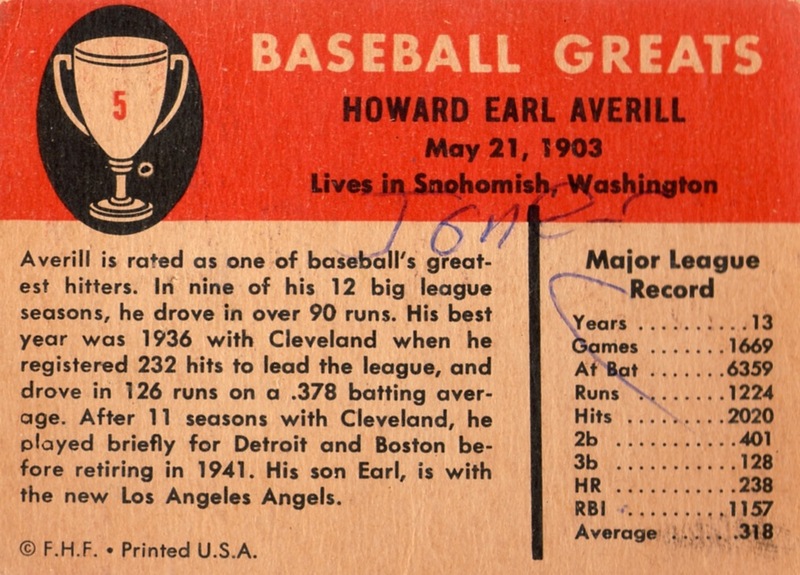 The son mentioned on Earl's card back is Earl Jr., who played catcher and outfielder for five teams over seven years. 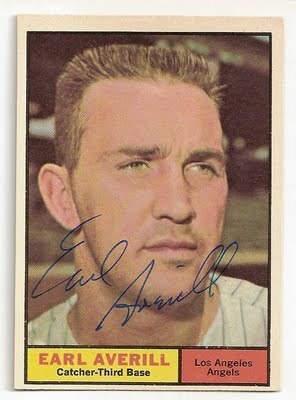 As luck would have it, 1961 marked Earl, Jr's best season by far. 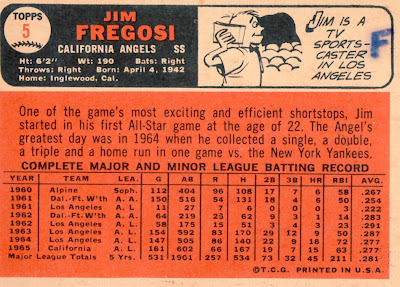 He slugged 21 homers for the expansion LA Angels--nearly half his career total of 44--and set career highs in pretty much every category. Based on the uniform pinstripes, I assume this Topps picture came from the two months Earl spent as backup catcher for the 1960 White Sox. Coincidentally, that was also the first time a team added its player names to their uniforms, a practice almost every team soon adopted. Check out ESPN Page2's history of South Sider uniforms for more details. This blog spent the last fortnight profiling Venezuelan sets, a South American neighbor that's home to many baseball fans and its own professional league since 1945. 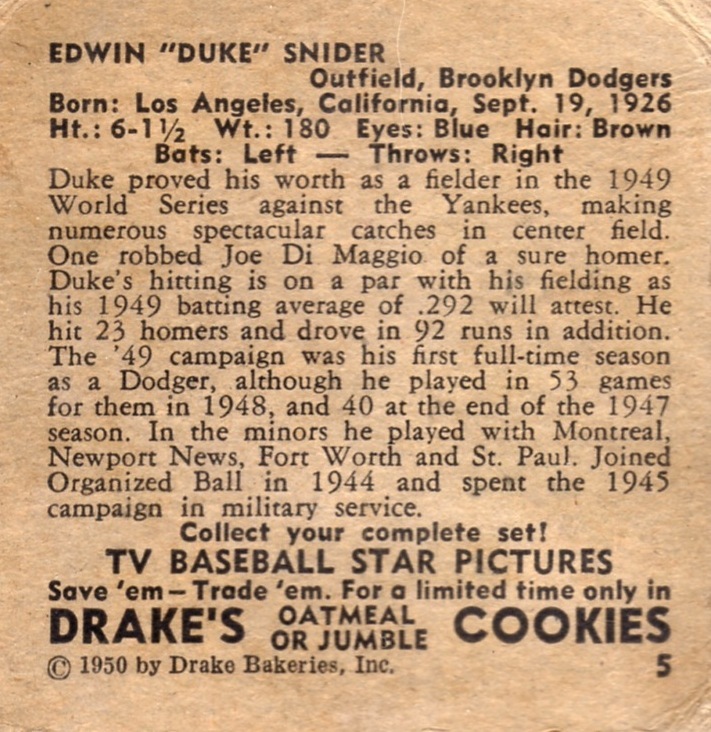 While native card production stretches back into the 1920s, Topps made the country more accessible to modern collectors by licensing their designs locally on-and-off during the 1960s. Building a complete set today is pretty much impossible, but singles turn up on eBay for as little as $10. The Oct 1967 to Jan 1968 winter season marked a turning point for South American issues, as they changed focus to Venezuelan pros. Just three years in that decade feature players in MLB uniform, though they all contain current, former, and future major leaguers playing for local teams. 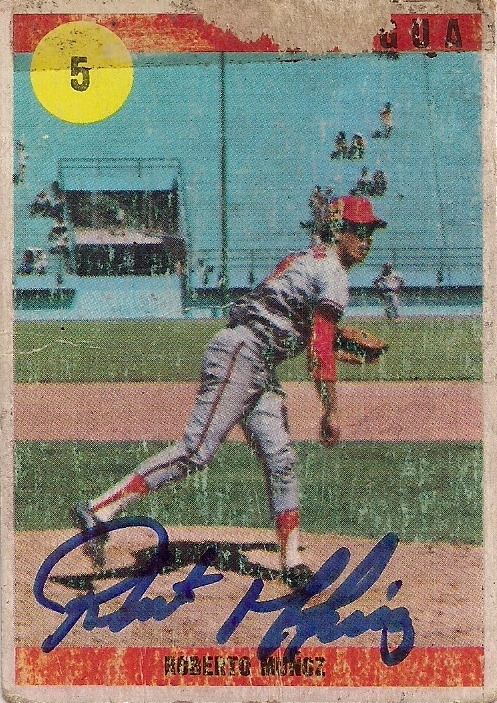 Several significant "pre-rookie" cards also appear, including a 1973 stamp of HOFer Jim Rice. 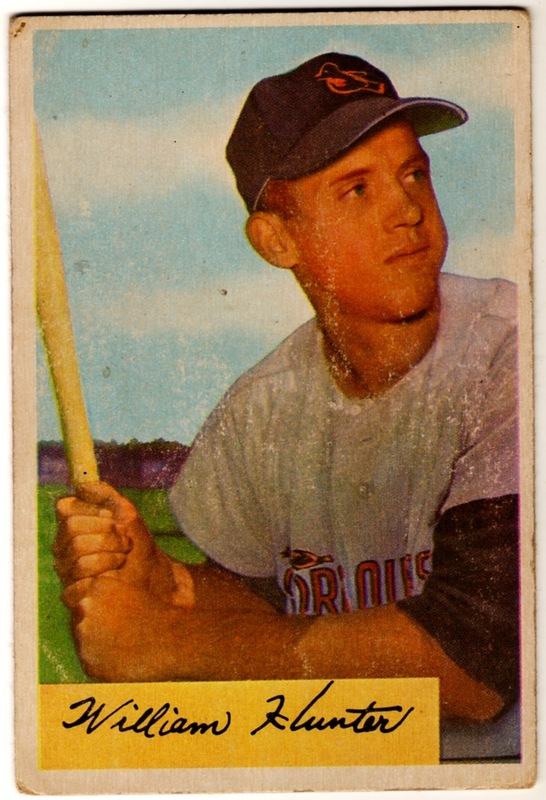 Topps made Venezuela (1959) and Canada (1965, via O-Pee-Chee) their first "expansion" partners, much like the MLB expanded west following WWII. 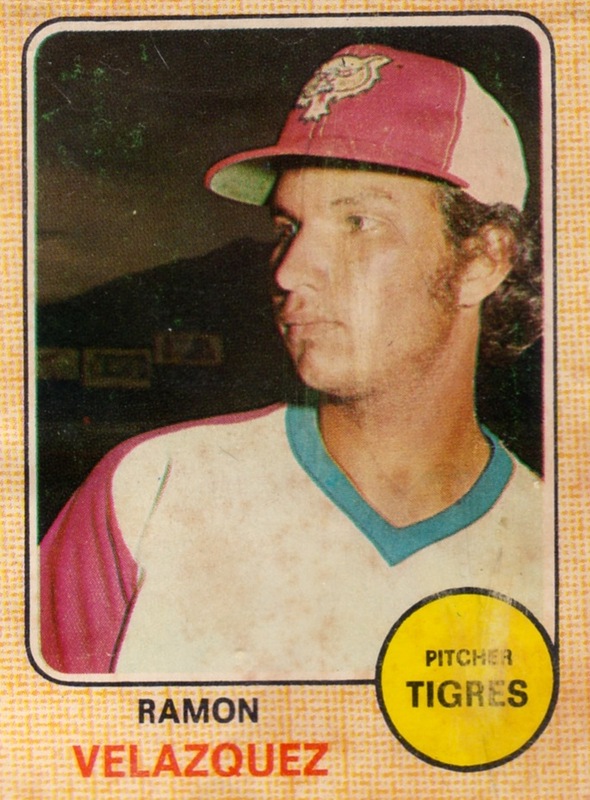 Questions remain around how Topps controlled (or didn't control) foreign set licensing, distribution, and availability, so it's been fun researching their makeup. See any of the links above for deeper dives into individual sets. 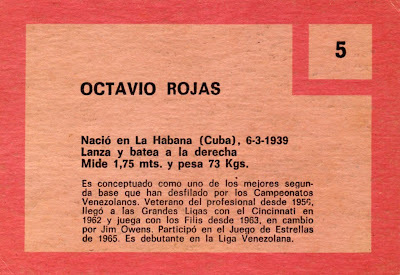 In 1967, Venezuelan card makers broke new ground by dedicating the 1st series (138 cards) to local pro players. 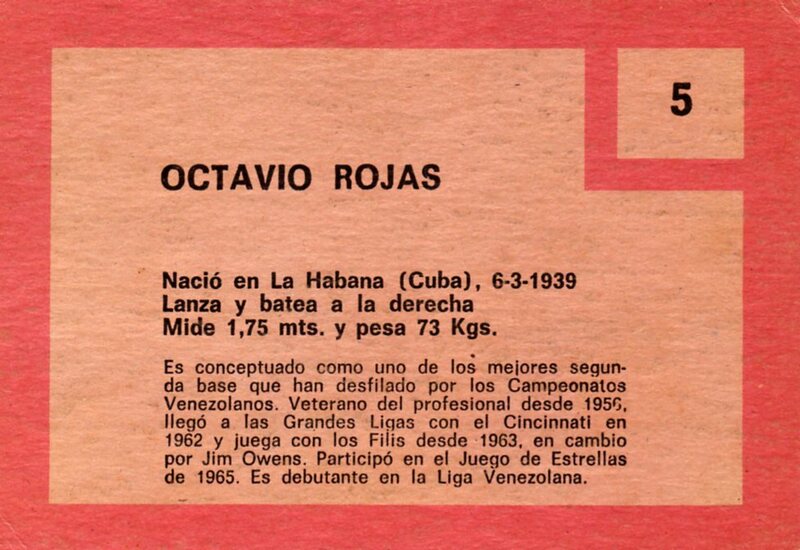 (Its #5 featured Cookie Rojas, an MLB veteran playing his first winter season in Venezuela.) 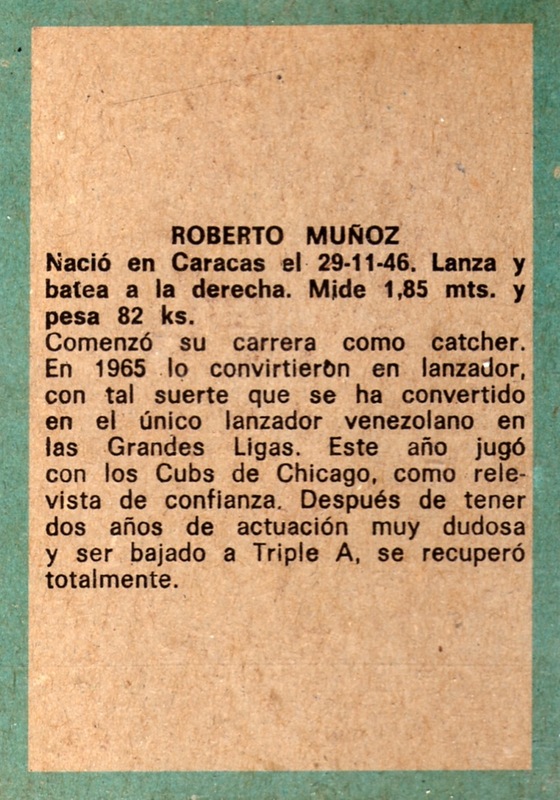 Three years later, local printer Sport Grafico--using a similar card design--upped the ante by dedicating a full 300 player set to their Liga Venezolana de Béisbol Profesional and its 1970-71 winter league season. This set features two series: #1-249 show active players and #250-300 show "Veterans" or "Immortals." Some MLB players signed winter league contracts to keep their skills sharp or earn extra money during "off-season," so also appear in the set wearing Venezuelan uniforms. 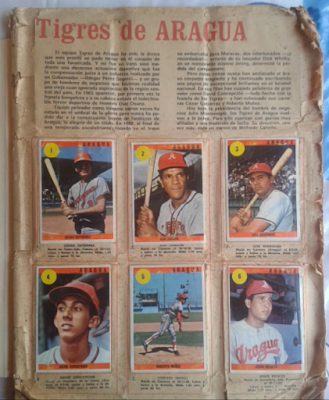 Many cards show glue residue from being mounted in an album, so "high grade" typically means EX condition for this and other Venezuelan sets. Thanks to blog reader Nathan for a translation of Roberto's bio! 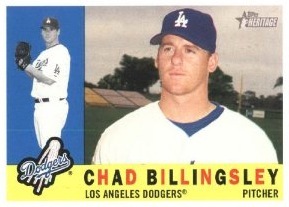 He began his career as a catcher. In 1965 he successfully converted to pitcher, and is the only Venezuelan pitcher in the major leagues. 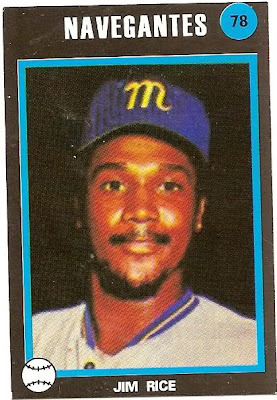 This year he played for the Chicago Cubs, as a reliever. He's recovered completely from two years of spotty performance, including a demotion to Triple A. 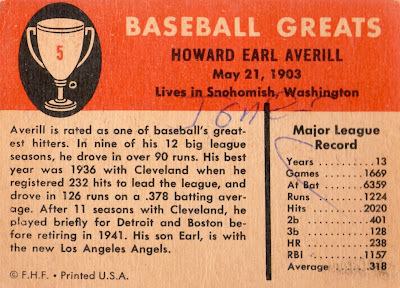 Interesting that this card shows his birth year as 1946, but Wikipedia and Baseball-Reference say 1941. Latin players who make a splash in the big league often face scrutiny about their age, if they come from a country that tracks birth dates less rigorously. MLB teams have a financial incentive to know "real" ages, since 25 year-old players are entering their prime, but 30 year-olds are about to leave it. 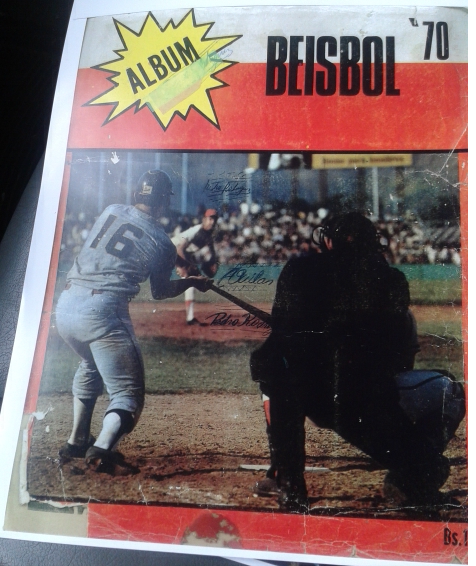 2014 UPDATE: Found an autographed #5! 2016 UPDATE: Album photos from OBC friend Rick! Value: Bought my #5 for $6 on eBay. Stars like Dave Concepcion and Luis Aparicio attract interest from both North and South American collectors, so can go for $100+ in decent shape. Welcome to 1966, midpoint of MLB's biggest era of geographic expansion. 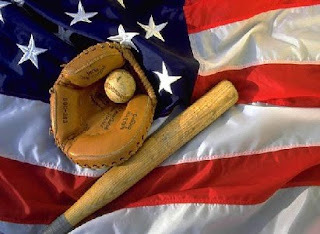 Between 1957, when relocated New York teams opened up our West Coast, and 1977, when the Pacific Northwest received its first team and Canada its second, baseball jumped from 16 teams to 26. 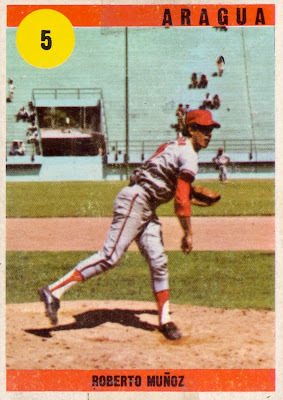 Ten years removed from acquiring Bowman, Topps remained the only company producing annual card sets, so made it their own era of "expansion" by licensing designs south to Venezuela and north to Canada, two other countries with pro baseball and solid fan interest. 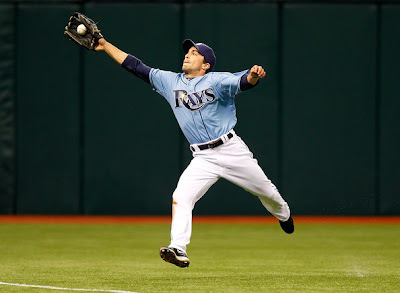 Today's hatless Fregosi image appears three times in my blog, thanks to those expanding marketing efforts. 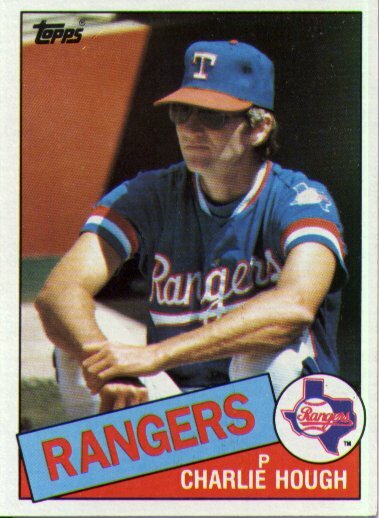 Topps clearly wanted to cement their reputation as "big league" wherever people watched pro baseball. 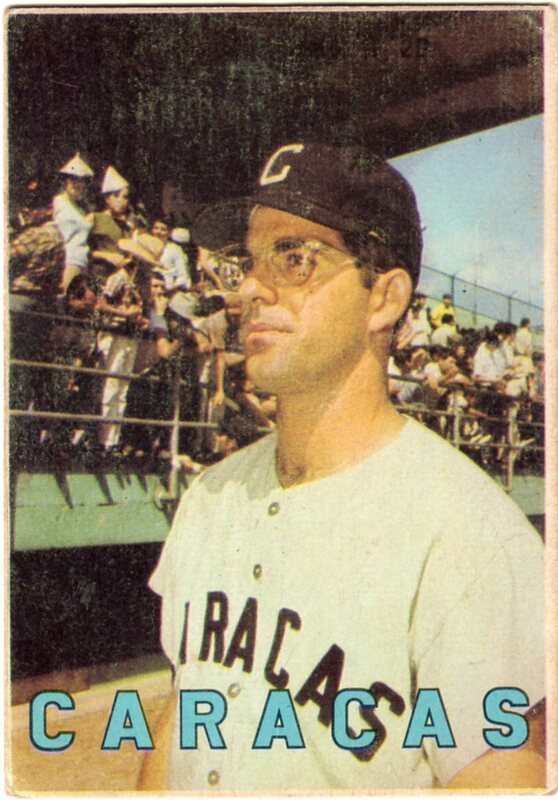 Venezuelan sets offered a way for local fans to track popular native sons like #90 Luis Aparicio and #365 Vic Davalillo, both of whom were established MLB All-Stars by 1966. 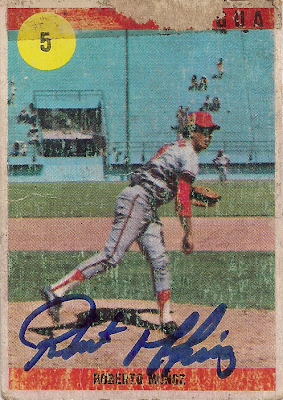 Luis even went on to win the World Series that year as an Oriole. 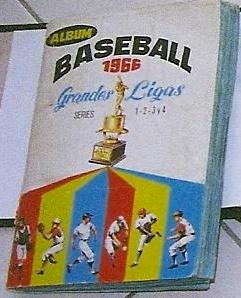 The 1966 album cover mentions 4 series of cards, but no range of numbers seem rarer than another, so it's likely print runs remained the same throughout. 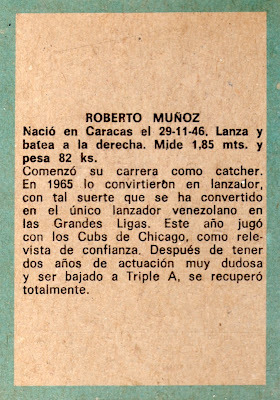 Value: South American specialist John Rumierz Cards sold me this for $5 in 2007. 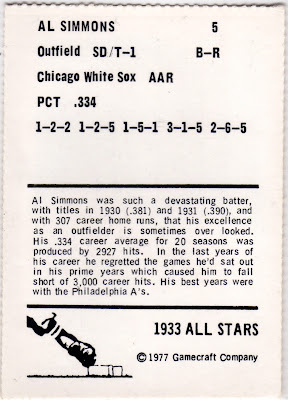 Mid- and high-grade singles get expensive quickly, since most surviving examples have back damage or writing. 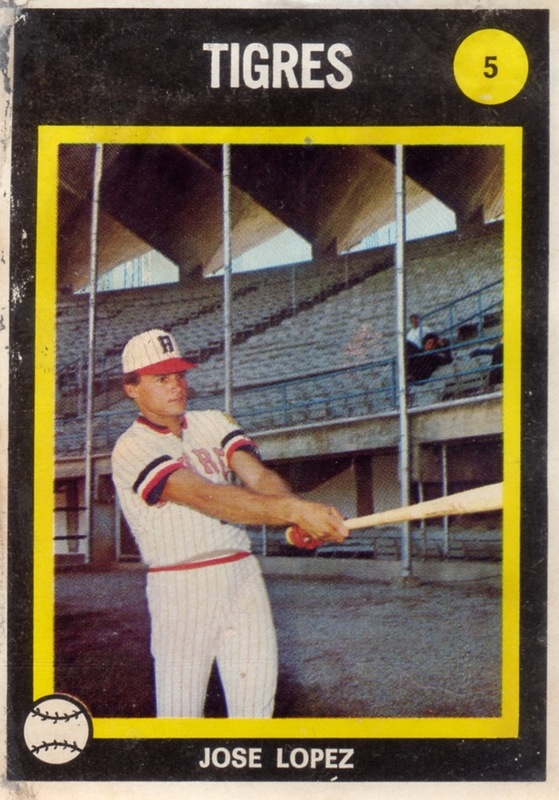 Fakes / reprints: Haven't seen any explicit Venezuelan reprints, though people can confuse them with normal Topps cards, since fronts and backs match. Look for their brighter pink ink on the back and no surface gloss. I think any Muppet Show fan would've traded all their Reggie Jacksons and Nolan Ryans for these five cards. My favorite band member (then and now) is Animal, but check out the custom back PRP sent me for Floyd! Click through for its full detail: that comic's superb and I'm surprised they stopped Dr. Teeth at only 9 anthems. Find the full run of these custom Muppet cards at Baseball Card Blog! Fakes / reprints: If only I could reprint these on my brain stem.